Bulgaria celebrates Tuesday the country's National Holiday, March 3rd and the 131st anniversary of its Liberation from five centuries of Ottoman dominance. 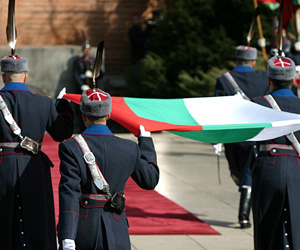 A solemn ceremony, including hoisting of the national flag in front of the Unknown Soldier Monument in Sofia is held at 11:00 with the participation of Bulgaria's President, Georgi Parvanov, the Speaker of the Parliament, Georgi Pirinski, and the Russian Ambassador to Sofia, Yuri Isakov. Parvanov, who is also Supreme Commander-in-Chief of the Bulgarian Armed Forces, will attend planned ceremonies throughout the day. He will take the salute of the representative units of the Bulgarian Army, which will be held Tuesday evening at the "Narodno Subranie" (National Assembly) square in the capital. The President and First Lady, Zorka Parvanova, will host the traditional reception at the historical museum at the Presidential Residence "Boyana." The 131st anniversary of Bulgaria's Liberation will also be honored with a solemn meeting on the square beneath the historical "Shipka" mountain top in Stara Planina (the Balkan Range). The metropolitan of Veliko Turnovo, Grigorii, will perform a memorial service for all Bulgarian, Russian, Ukrainian, Romanian and Finish soldiers, who gave their lives for the country's freedom. Wreaths and flowers will be laid at the Liberty Monument at "Shipka"
Ceremonies, celebrating Bulgaria's National Holiday, are traditionally held throughout the country, particularly solemn in towns and cities boasting victorious battles of Russian and Bulgarian soldiers in the 1877-1878 Liberation War. This March 3rd such ceremonies will be held in Pleven, Gabrovo, Sevlievo, Dryanovo, Tryavna, Karlovo, Sliven, Plovdiv, Smolyan, Chepelare, Hisar, Nova Zagora, Straldzha, Tundzha, Pernik, Varna, among many. The Bulgarian Economy Minister, Petra Dimitrov will take part in the celebration in Varna. Monuments in honor of those who contributed to Bulgaria's freedom are erected all over Bulgaria, including Sofia's Doctors' Monument (engraved with the names of 531 Bulgarian and foreign medics who died during the war), the Shipka Monument (on one of the most precipitous areas of the Balkans Range), the Tsar Osvoboditel Monument in downtown Sofia, in front of the Parliament building, portraying the Russian Emperor Alexander the Second on horseback. March 3 was honored for the first time in 1880, in the occasion of the Enthronement of Russian Emperor Alexander the Second. Since 1888, March 3 has become Bulgaria's Day of Liberation, but it was not declared National Holiday until 1978. The Peace Treaty of San Stefano marks the revival of the Bulgarian State, dominated by the Ottoman rule since the end of 14th century. Bulgaria, however, became a truly independent country after the Congress of Berlin, which took place a couple of months later in 1878, despite the fact that it ended with the redistribution back to the Ottoman Empire of certain Bulgarian territories that the previous treaty had given to the Principality of Bulgaria, most notably Macedonia. The Congress of Berlin (June 13 - July 13, 1878) was a meeting of the European Great Powers' and the Ottoman Empire's leading statesmen. In the wake of the Russian-Turkish War, 1877-78, the meeting's aim was to reorganize the countries of the Balkans. Otto von Bismarck, who led the Congress, undertook to balance the distinct interests of Britain, Russia and Austria-Hungary. The congress was aimed at the revision of the Treaty of San Stefano and at keeping Constantinople in Ottoman hands.